Property developer Meriton has been unceremoniously told to go back to the drawing board with plans to build an "appalling-looking" 76-storey skyscraper in the Brisbane CBD. 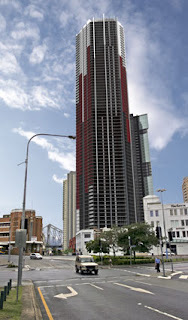 Liberal and Labor politicians used a meeting of Brisbane City Council's urban planning committee to roundly condemn the proposed Adelaide Street tower for its potential traffic impacts and "appalling design". Lord Mayor Campbell Newman also made an unusual visit to the meeting to declare his opposition to the 403-unit project in its current form. 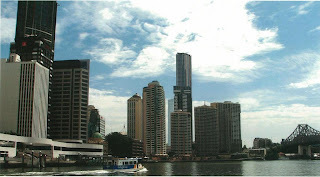 The proposed site is at the intersection of Adelaide and Macrossan Streets in the so-called Petrie Bight, one of Brisbane's most densely populated precincts. Its 400-plus units would be a mixture of serviced and residential apartments, set atop a podium of commercial space and 10 levels of carparking. Central ward councillor David Hinchliffe said many locals were worried another influx of apartment dwellers would choke the tiny streets around the area, which is already home to Skyline and the Macrossan building, which is under construction. But Meriton planning manager Walter Gordon said the company had been working closely with council planners for 12 months to sort out the traffic issues. Council planning chair Amanda Cooper said the committee was also "underwhelmed" with the tower's design. "We want to see something we're proud of, not something we're trying to disguise with other things around it," Cr Cooper said. And Cr Newman asked his comments be noted in the meeting minutes. "We've been talking about excellence in design for years here," he said. "This does nothing, I don't see any merit in that whatsoever." A disappointed Mr Gordon said he was unaware such objections existed. "I'm a bit disappointed that having worked so closely with council and we come up to this stage to hear nobody likes it," he said. The committee instructed Meriton and council planning officers to do more work on traffic management and design.